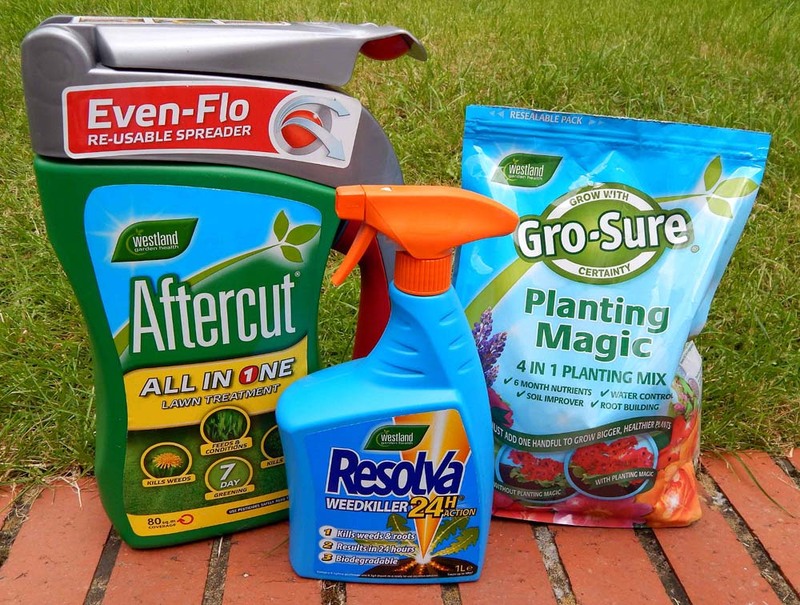 I have received three products all of which are supposed to help me keep my garden neat and tidy this season. They are all different and thus they all have a different purpose. Gro-Sure Planting Magic is 4 in 1 planting mix, which is helping your plants to grow bigger, stronger, healthier and more beautiful than ever. Firstly you need to know that this is not a soil. 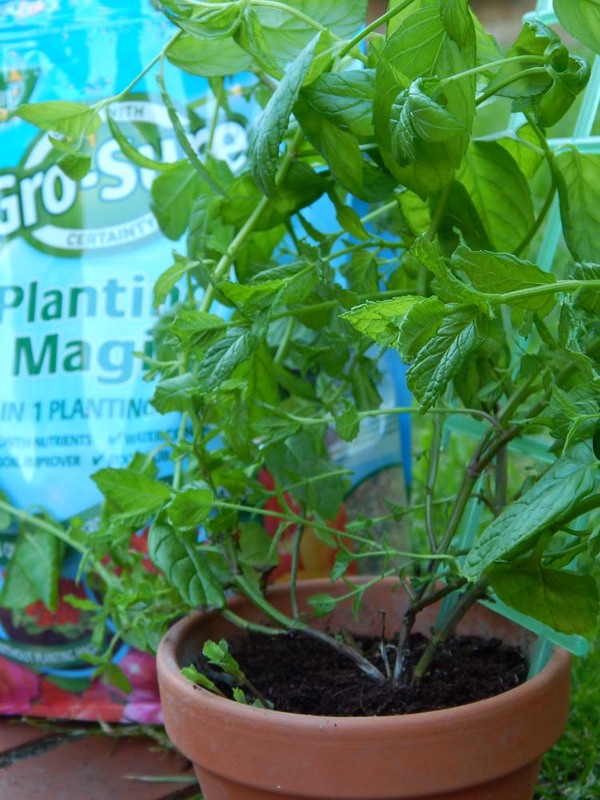 Gro-Sure Planting Magic is a nutrients mix which you add to your soil. Depending on the size of your plant you will need a handful of the mix… or more for a bigger specimen. The measurements and full instructions are actually provided on the back of the packaging, so all you have to do is read the “label”. Think about it as a “vitamins” for your plants… it might sounds silly but this is exactly what Gro-Sure Planting Magic is. This is hard to say without doing a side by side comparison planting of the same plants and watching them grow. I used it for replanting a shop bought mint, which we use in our baby potato salad. I see no point in buying it over and over again, so I decided to keep it alive and let it grow in my kitchen. So far it is doing beautifully, considering the fact that we pinch some leaves from it at least once a week. Gro-Sure Planting Magic contains 6 months of nutrients, I am not sure my mint will survive that long but for this moment it looks great and it is growing fast. Love the packaging. First of all it is re-sealable which is super handy; secondly it has a see-through side window which allow you to see the product before you buy it and third which I have already mention it has all the instructions clearly stated on the packaging. As stated in the name of the product is it a weed killer. 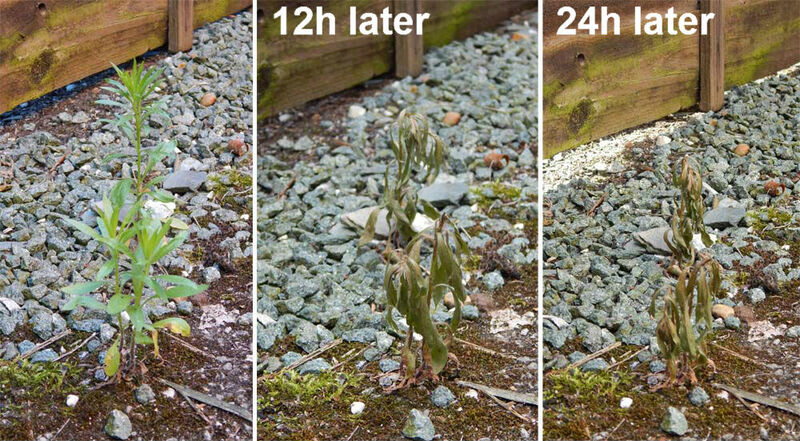 It is alleged it will kill weeds and its roots within 24 hours. The application is extremely easy, all you have to do is point and spray unwanted objects a.k.a. weeds, but be careful where you spray as it will also kill your lawn, or bushes or flowers… if you spray it, it will kill it. I sprayed these 2 test weeds at 8pm at night. Middle picture is from the next morning and the last one is from 8pm, so exactly 24h after the original application. These were not the smallest of the weeds but I wanted to see how Resolva would handle them… looking at the results I would call it job well done. There are a lot of warnings and things to consider before using it. You have to be very carefully where you spray it so you don’t accidently kill your favourite bush of roses. There is also the matter of children and pets safety – it is not safe for them, neither is it for you! So take all necessary precautions when using it, wear gloves and be careful… oh and do not let your children or pets out anywhere close to the treated area until it is totally dry. Once all the liquid is absorbed into the weed, it supposed to be safe. I am unlikely to use it in my back garden as my cats spend a lot of time there but it is very helpful on all the pathways in front of the house. Finally I am able to have a clean and weed free front of the house without hours of hard work. 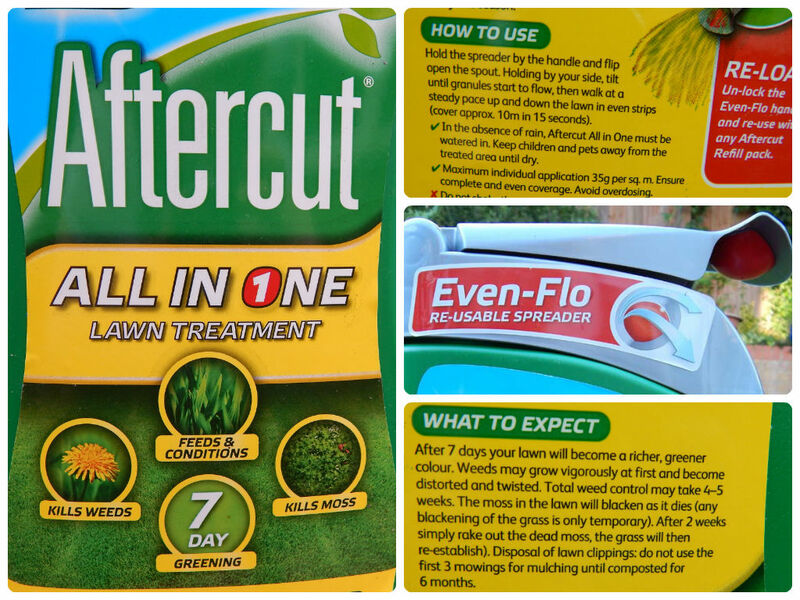 Aftercut All in One Even Flo Spreader is a grass conditioner and a weed killer all in one. Again all the instructions are clearly provided on the packaging. You use the spreader and walk at a steady pace and let the granules drop on to your lawn. The spreader should provide an even coverage all around. Worth remembering is that the lawn needs to get some water later on in order for granules to soak into the ground, so if there is no rain, you will have to water your lawn. No idea. This is actually the one product which I wanted to try the most… but I didn’t. Again, it is not pet friendly and I am not going to take any chances. Due to the nature of the product it is not going to just dry up in minutes, it will stay on the lawn for a while and I have no option of locking my cats out of the garden (ok, I could do that I suppose but I don’t really want to). I am feeling a bit disappointed that I am not able to use it. I would love to see how my grass looked flourishing after this treatment and all the weeds have disappeared but I value my pets more. My lawn takes half of my back garden and there are no fences around it to separate it. I like the idea of the product and design of the packaging… if the even spreader works as it is stated on the box it should be a pleasure to use, but I will never get to experience it… So if you tried Aftercut All in One Even Flo Spreader please do let me know if it works. * I received these product for free for review purpose. All opinions about the products are honest and my own. 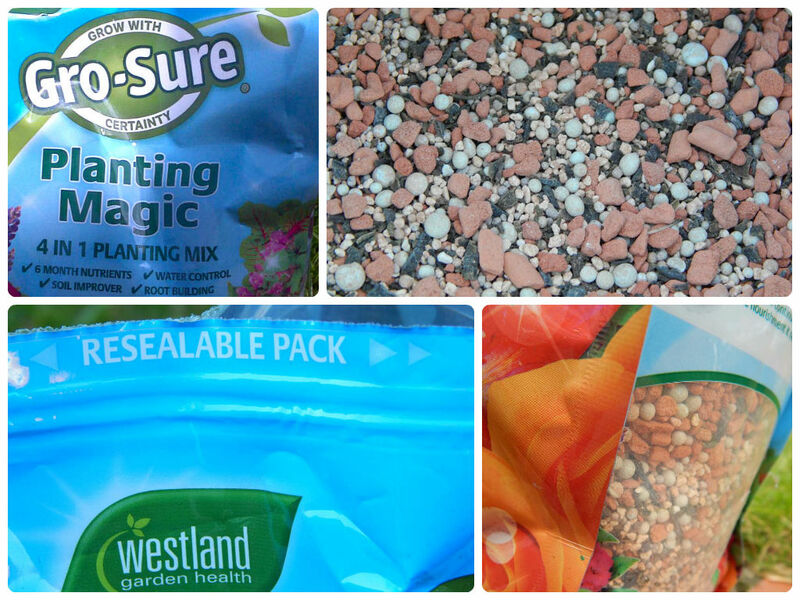 Is it crazy that I am about to add the Gro-Sure Planting Magic to hubby’s fathers day gift? He is a gardener! I think that this is a lovely idea. I am sure he will make a good use of it. I would love to try the Gro-Sure Planting Magic! Thanks for the review. going to pass this along to some friends of mine who garden. thank you for the detailed information! I used to love to manually pull out weeds. Now I it doesn’t thrill me anymore. Getting to old. So the weed killer looks like the product I would use. Thanks for the info! I love to garden! I don’t blame you, I wouldn’t have used any non-animal safe products, either. I have two dogs and I would be nervous about that! 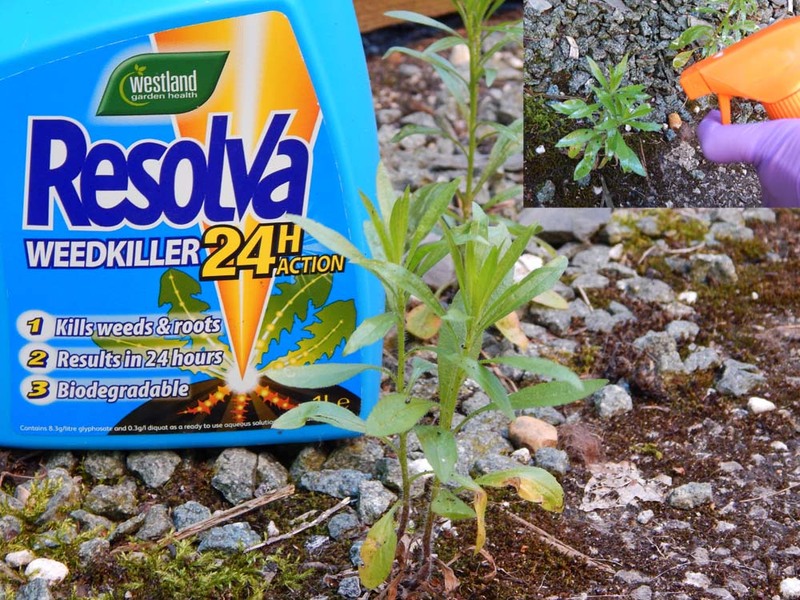 I already use Resolva, it does a really good job…I used to pull out all the weeds by hand but don’t have the strength at the moment…my dad also found me a weedkiller that’s safe to use on lawns but I only use it very occasionally when I’m sure the dog won’t be trying to follow me round with it! Interesting, but I am against all toxic fertilizers, and definitely think that weedkillers should be absolutely a last resort. The incidental damage done to other plant life, birds and insect life is often extreme. Before, animals would eat the weeds and now we have weed killers that might be toxic to even the weed eaters. Go figure. I think you made the right decision not to take the chance of harming your pets. We have these dandelion looking weeds that have really strong thorns that make pulling them out a real pain. Do you have those too? I wish I had green fingers, I am hopeless at growing anything. This is all good for me.. since i have a red thumb!